How do I open an image in a lightbox modal? If you would like an image to open up into a lightbox modal when the user clicks on it then you can use MetaSlider Lightbox, a separate plugin that extends MetaSlider. With the plugin activated you’ll see a new checkbox within the ‘Advanced Settings’ panel – ‘Open in lightbox?’ – and when enabled the slides will open up in a lightbox if the user clicks on them. 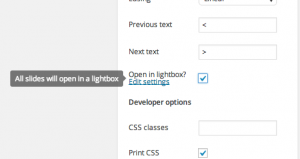 The lightbox settings are controlled via Simple Lightbox so it will keep things consistent across your site.